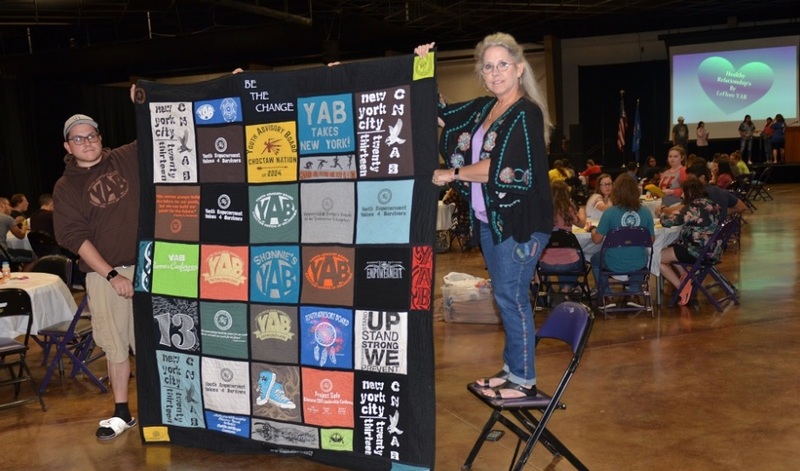 Arlie Crouch left, and Shonnie Hall displays the quilt of Youth Advisory Board T-shirts at the organization’s Leadership Conference Tuesday in Durant. DURANT, Okla. – Arlie Crouch is an excellent example of the impact of the Choctaw Nation’s Youth Advisory Board. Crouch began participating in YAB when he was a freshman in Howe. Now 23, he is volunteering to help other youth at the annual Youth Advisory Board Leadership Conference this week in Durant – as he has every summer since he graduated high school. During his years of participation, Crouch collected T-shirts from every YAB trip and project he was a part of. His mother Frances, a seamstress, did not toss out those treasured cotton memories when he outgrew them. Instead, she fashioned them into a unique quilt that her son is displaying at the conference. YAB Special Events Coordinator Shonnie Hall is quick to pipe up, “Arlie was a youth in my group when he was growing up,” as she proudly helps him hold up the artwork that’s filled with reminders of YAB experiences for her also. Hall said there is 140 youth in attendance, along with 30 adults, at the three-day YAB Leadership Conference being held at the Choctaw Event Center, where youth-oriented booths fill the lobby. Many booths are giving away items from school supplies to summer souvenirs. The YAB chapters also have booths of their own. Opening day included remarks by Janie Dillard, Executive Officer of Operations in the Division of Commerce of the Choctaw Nation of Oklahoma, who spoke about the boundless opportunities that await them in the future. Also, Sara-Jane Smallwood-Cocke, Director of Choctaw Nation Government Relations and Promise Zone Coordinator, pointed out that this year’s elections have nine Choctaws on the state’s ballots. Smallwood-Cocke explained that any high-schooler interested in politics should consider signing up to become a page. The convention agenda also includes presentations on health, self-esteem, healthy relationships and what to do in an active shooter situation. The students will have a demonstration on traditional Choctaw dance, have their own contemporary dance party, put on a talent show and have elections for a new slate of officers and representatives for 2018-2019. Jayda Janway is in her second year as Chair of YAB, having been elected twice by her fellow students. She is a 15-year-old junior who attends Heavener High School. Turned on to YAB by her older sisters, she first got involved in the eighth grade. Though she may no longer be in the same position, will she continue to be in YAB? “Absolutely,” she answers quickly. YAB is under the Youth Empowerment Program of the Choctaw Nation, based in Clayton. Sixteen YAB chapters meet monthly in the 10½ counties of the Choctaw Nation. To join YAB, a student must be in 8th-12th grade, reside within the 10½ counties of the Choctaw Nation and “have a desire to make a difference in your community.” YAB activities over the past semester have been as big as collecting food for the Soper Food Bank, assisting with the 5K Glow Run held in Latimer County and a beautification project for Atoka to as small as mowing and cleaning a yard for a senior citizen. To apply for membership or for information about the Youth Advisory Board, contact Martina Hawkins, Director at (580) 317-6237 or mhawkins@choctawnation.com.